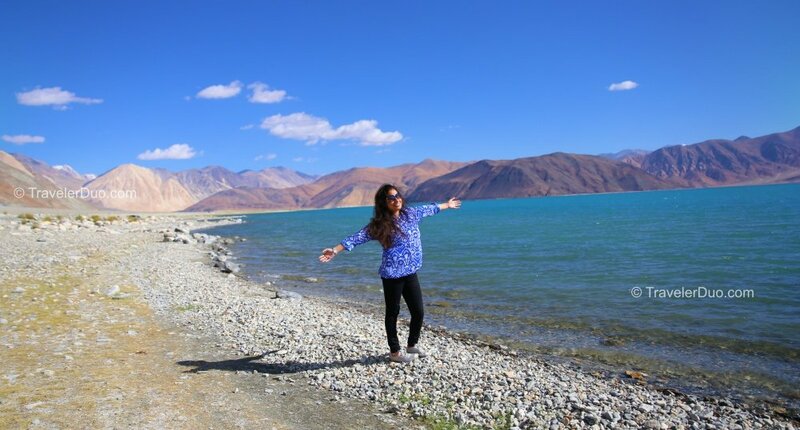 Ladakh is one of the most beautiful parts of India, a diverse region outstanding natural beauty, historical monuments, safaris, adventure spots and a good deal more besides. 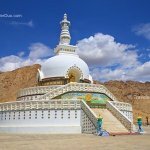 Ladakh is a unique blend of Indian, Buddhism, and Tibetan, making it one place that should be on your must-visit list. The rolling hills are visited yearly, not just by foreign tourists but by locals too, in the summer and in the winter. The mountain peaks are covered in snow, looming over the lush green countryside. 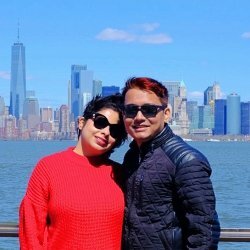 It is a popular spot with honeymooners and with adventurous people who like to go trekking, rafting, mountaineering and some of many other activities on offer. 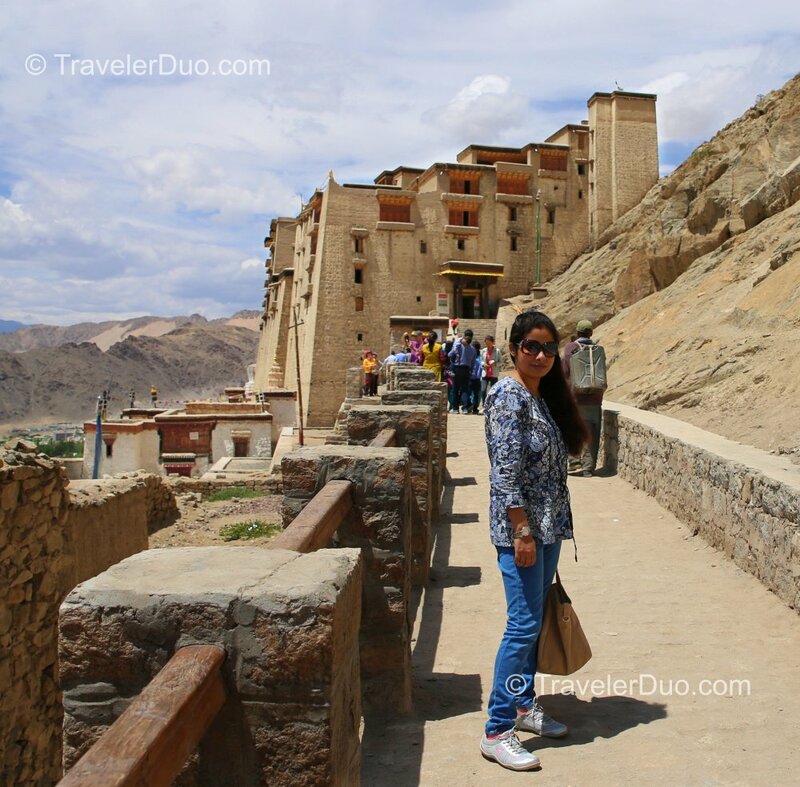 When you visit Ladakh, make sure you that make time to go these places. Pangong Lake is situated in the Himalayas at about 4,530 meters. It is 12 kilometers long, stretching from India to Tibet. Because of the altitude, the temperatures stay low, between -5°C and 10°C; because of this, despite the lake being saline, the winters see it freeze over completely. The waters are constantly changing color, from azure through to light blue, then to green and sometimes grey. It has long been a place that attracts tourists and, because many films have been shot here, it has become ever more popular. Khardung La Pass is the gateway to the Shyok and Nubra valleys, both in the regions of Kashmir and Jammu. The pass, often called Kardzhong La, is one of the most strategic and important asses to the Siachen Glacier and is also thought to be the highest pass that is passable by motor vehicle, standing at 5,602 m. The clean air and the spectacular beauty all around provides visitors with the feeling of being at the very top of the world. The pass is only open between May and October. The Nubra Valley is a vibrant green belt in the barren Ladakh desert with its slops and landscapes reminiscent of the moon. Nestled in the Karakoram mountain range, the Valley is fed by two rivers and is home to Alfalfa and Sea Buckthorns. In the summer, the valley is covered in a pink and yellow carpet of roses and in the autumn, the lavenders prevail, both seasons producing fantastic sights. 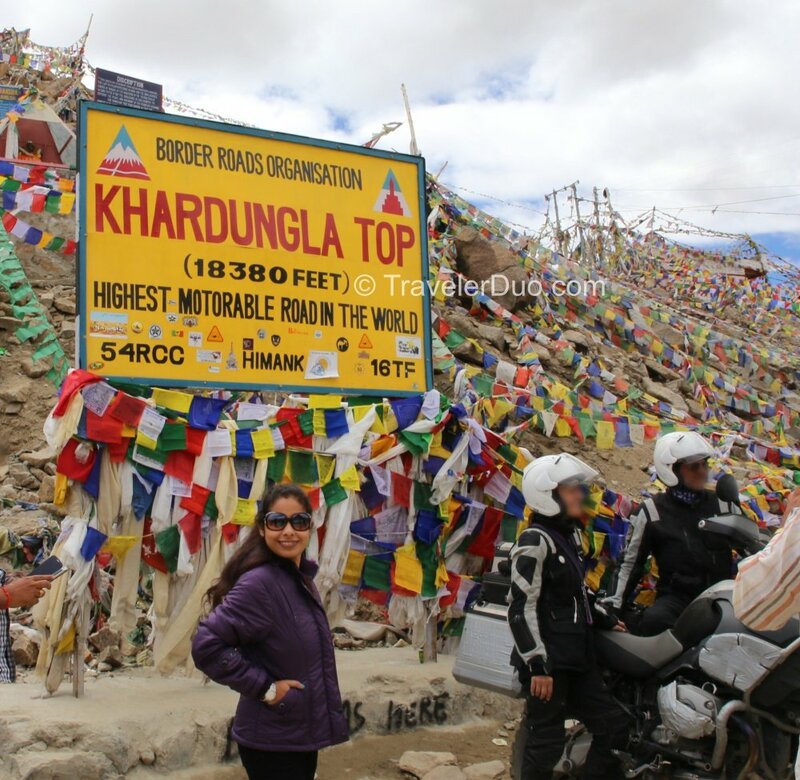 To get to the Nubra Valley, you must get an Inner Line Permit in Leh Ladakh first. Shanti Stupa is a Tibetan structure the likes of which has never been built anywhere else in the world. 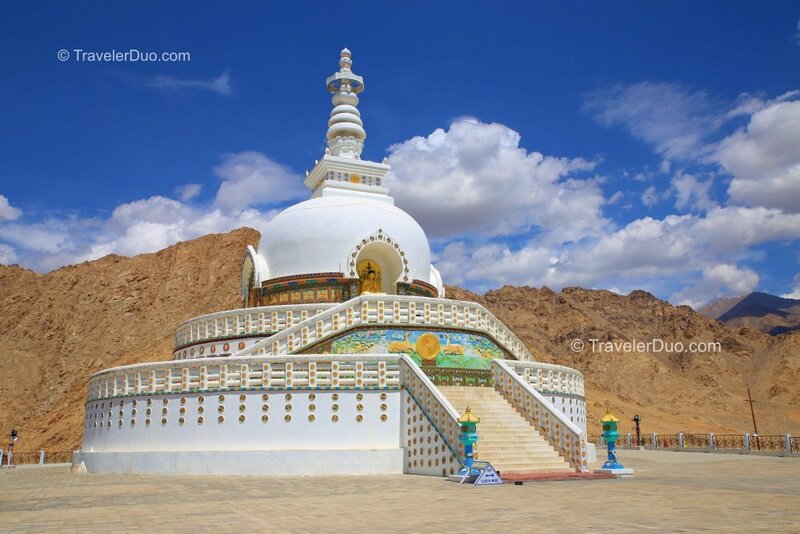 It is a white-domed building dedicated purely to Buddhism and, situated at the top of the Hill in Leh Ladakh, is one of the top tourist spots, for both religious purposes and for the spectacular scenery and views of the mountains around it. It is one of the finest remaining examples of the ties between India and Japan and was built in 1991 by Bhikshu Gyomo Nakamura, a Japanese Buddhist. It was a joint effort between the Ladakhi and Japanese Buddhists as a way of marking that 2,500 years of Buddhism had been completed, as well as a way of promoting peace across the world. Also called the Lhachen Palkar, the Leh Palace is probably the single richest building in the country in terms of historical influence. It can be found in Kashmir, in Leh town and was constructed as a Royal Palace by King Sengge Namgyal in the 17th century. It is one of the tallest buildings of its era, soaring 9 stories high with fabulous views over Leh, and the Zanskar and Stok Kangri ranges of the Himalayans. Tourists can see some beautiful sunrises and sunsets from the top of the palace and this is just one of the draws for tourists from all over the world. On special occasions, like the Galdam Nomchot festival, the palace is lit up and, although much of it is now in ruins, thanks to the 1st century invasion of the Kashmir, it is still one of the best places for tourists to explore. There are still ancient relics, utensils, paintings, and cutlery that were once used by the Royals to be seen, along with artifacts that line the walls. The Palace is currently being renovated by the Archeological Survey of India in an attempt to keep alive the Namygal Dynasty history.